All Local Women Artists are Invited to Attend! Bring a dish to pass and the willingness to share something about your favorite woman artist. SWAN Day is celebrated annually on the 4th Saturday of March. However, events observing this occasion are schedule around the world from March 1st to April. There are many ways to Join this Celebration of Women Artists. 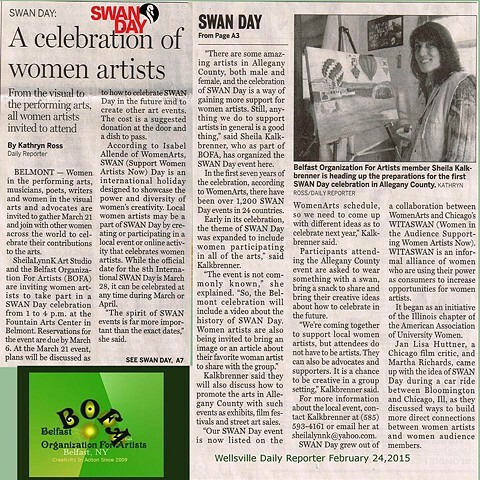 To celebrate and support local women artists and influential women in art history this year in Allegany County, NY; the community is invited to attend a SWAN Day Party at the Fountain Arts Center in Belmont, NY. "The idea for SWAN Day grew out of a collaboration between WomenArts and Chicago’s WITASWAN (Women in the Audiences Supporting Women Artists Now). WITASWAN is an informal alliance of women who are using their power as consumers to increase opportunities for women artists. It began as an initiative of the Illinois chapter of the American Association of University Women. The complete history of WITASWAN is at www.films42.com/witaswan.asp. "...."Jan Lisa Huttner invited Martha Richards, the Executive Director of WomenArts, to speak at an American Association of University Women conference in Bloomington, IL in April 2007. FIND OUT OUR FAVORITE WOMEN ARTISTS presented during the party.